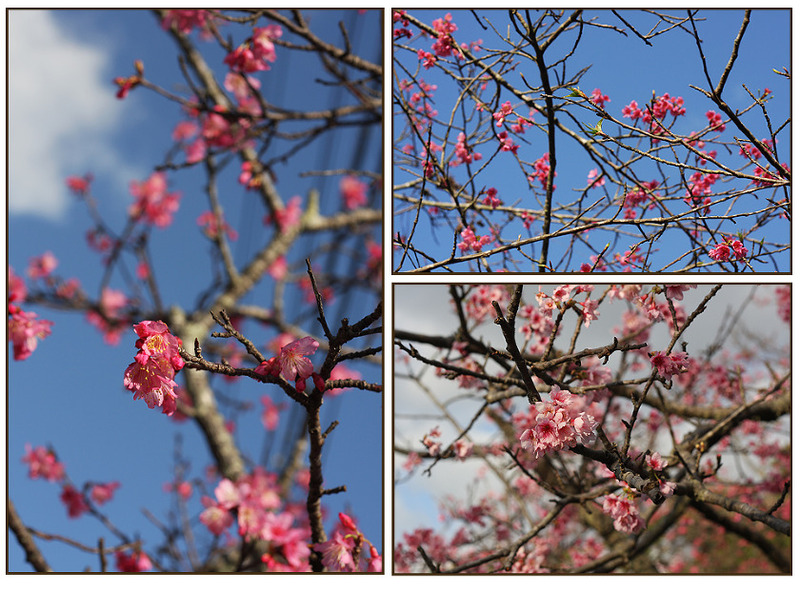 Cherry Blossom Festival – Every February in Okinawa (about a month before mainland Japan) the cherry trees burst into bloom. The blossoms here are a deep pink–not pale white/pink like the rest of Japan–and I looked forward to their beautiful display every year as a sign of the end of the dull winter season. On the north part of the island there is a festival every year to celebrate. It includes a parade with all kinds of traditional dancing and music, and blocks of food and souvenier stands. A really fun day for the whole family! 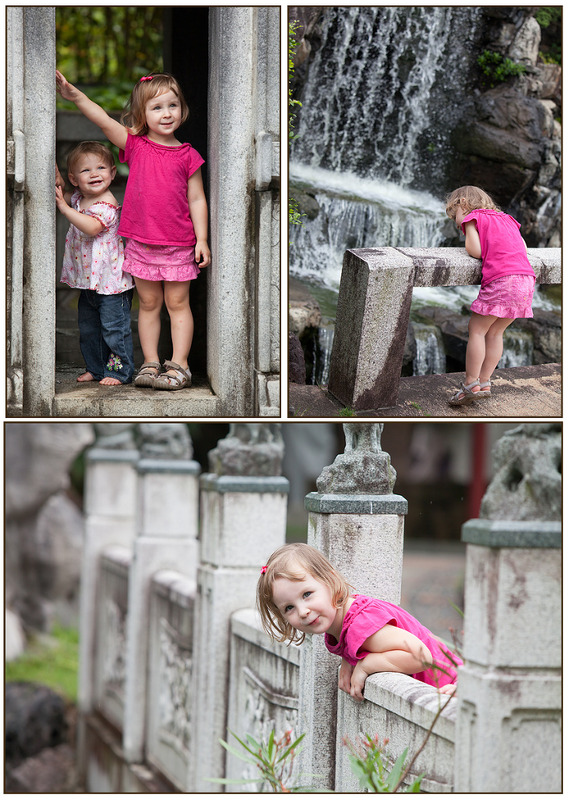 Fukushu-en Chinese Garden – Down near Naha there is a gem of a place…a lovely Chinese style garden full of intricate stonework, waterfalls, odd shaped windows and buildings (perfect for hide and seek!). Churami Aquarium – One of the best aquariums in the world, you can spend an entire day here. They have outdoor pools and shows, a giant playground and flower sculptures, an underwater tunnel with whale sharks and manta rays. Zakimi Castle – A wonderful castle that is pristine and almost never crowded. Kids can run around in the fields of wildflowers and climb the stone walls for an amazing view. And yes, I went through a phase of dressing them in matching outfits..
Dragon Boat Races – Each year during Golden Week (early May) there is a large festival that includes dragon boat races. The biggest one is in Naha, but there are several other races spread around the island, and they are all very fun to watch. 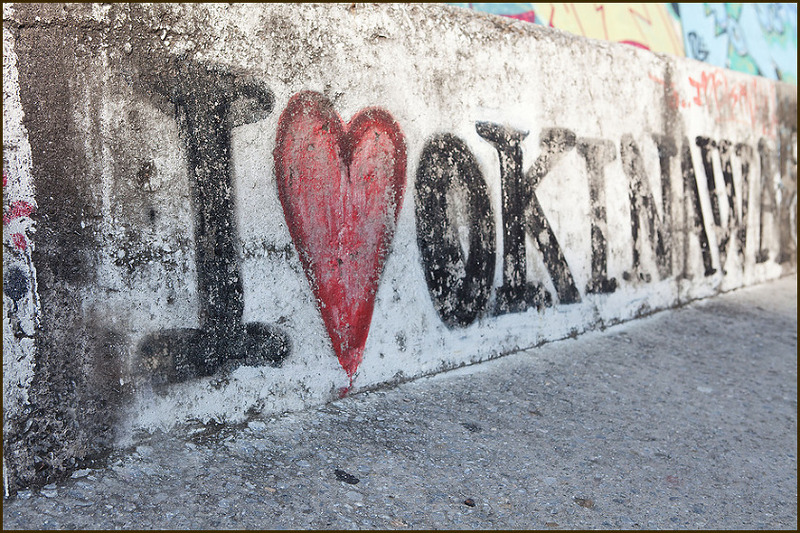 Okuma – A lovely escape for US service members. You can rent cabins right on the beach here. The water is clear aqua all year round, and the whole place has a peaceful aura. We spent Claire’s first birthday there and had such a nice time playing in the hedge maze, collecting pebbles and sea glass on the beach, and riding the 4 person “buggy bike” around the property. Ryukyu Butterfly Park – A super fun little side trip. It is full of butterflies and they landed on the children, to their delight. Cape Hedo – Also known as Hedo Point, it’s the northernmost point on Okinawa, and the beautiful view is worth the long and windy drive. Araha Beach – A fun little beach that features a huge pirate ship playground! Kids can climb the rigging and there’s even a small zipline. Whale Watching – January through april is peak whale watching season, and if you take a charter out during this time, you are almost guaranteed to see these amazing, huge creatures. We had a quiet trip with very few sightings, right up until the end where we ended up right next to several adult whales. The last hour was filled with humpback whales surfacing, breaching, and tail-slapping. Claire was just a baby but Skye watched them in awe. American Village – A fun area near the military bases that is filled with tasty restaurants, a movie theater that serves beer, a ferris wheel, giant arcade, fish pedicures, and more! The photo booths are always a fun place to stop. They take photo booths very seriously in Japan and you get the full experience, including some kind of program or algorithm that makes your eyes bigger (and appears to add eye makeup, ahem, Jason). Shuri-Jo Castle – Shuri castle is a must-see day trip in Okinawa. In addition to the intricate beauty of the castle itself, there is a tour and outbuildings where you can learn some of the history of the island and how both the Chinese and Japanese influences have shaped the local culture over time. Toguchi Beach – Toguchi Beach is a lovely place to explore. It’s a popular spot for photographers to take family photos at sunset and early in the morning. There is a walking path, playground, and limestone caves to wander through. My favorite time to visit is at low tide. The water recedes to reveal acres of smooth stones covered with a green, spongy, moss-like plant that squishes pleasantly under your feet as you walk. Tide pools are full of interesting creatures like spiny urchins, crabs, and sea cucumbers. Bull Fighting – Japanese bull fighting is a much more family friendly affair than in Europe. No blood is involved. The bulls just push their heads together and lock horns in a dominance battle until one tires and gives up. Then the winner is covered in a cloth and paraded around the ring as the audience cheers. Super fun and the happy energy of the crowd is contagious! Lily festival – Every year on the tiny island of Ie, there is a lily festival. It’s just a short scenic drive and ferry ride from central Okinawa. We went in 2010 and had a blast frolicking among the giant fields of white and vibrantly colored lilies. And after we became exhausted from the May heat, a tasty little ice cream stand featuring purple sweet potato ice cream was the perfect end to the day. Diving and Snorkling – Unfortunately, since I was pregnant and nursing for a good portion of our time in Okinawa I only got to complete a few dives. Jason explored the best dive spots a good bit though, and there is quite a variety of fascinating sea life to view. I must admit, although I really enjoyed my dives, the extremely venomous local sea snakes seriously freaked me out. Cape Zanpa Lighthouse – The stately lighthouse is a nice place to visit, and kids love to crawl around on the rocks. Right across the street is a massive Shisa Dog guarding the entrance to the park. Nago Pineapple Park – This is a perfectly kitschy touristy type stop, a complex completely devoted to pineapples. There’s a ride on an automated car that takes you through the park and includes a brief history and some information about pineapples. Then comes the yummy part:) They have pineapple wine and vinegar tastings, moist pineapple cakes, and fresh pineapple ice cream. Gate 2 Street and the Sunabe Seawall – Living on Kadena, we were close to two fun and colorful areas to walk around, sample restaurants, stop at parks, and people watch. Gate 2 street was walking distance from our house and always full of colors and interesting people. The seawall area was a short drive and full of surfers and quiet cafes. Of course there are many other such areas, but those were the places we often frequented with the kids and we had all of our favorite spots.